As a nation of more than one billion potential customers, China represents a dream market for many retailers. This is especially the case since the leadership has declared its commitment to boosting consumption. To this end, the State Council has recently committed to lowering import tariffs on high-demand goods, and will set up more duty-free shops at ports. Moves to increase housing consumption in the wake of a real estate slowdown have also been in play for the past year. However, dreams of tapping China’s expansive market may be checked by the reality that efforts to strengthen consumption fail to pack a punch. Certainly, demand for consumer goods is present. Chinese consumers are increasingly sophisticated. Many own automobiles, cell phones, computers, and wear foreign-brand clothing. Increasingly, shoppers purchase goods online for delivery straight to their homes. The rock-star popularity of Alibaba and JD speaks to the lure of the time-saving, brand conscious good life. At the same time, Chinese shoppers are not as ubiquitous as they appear. China’s level of consumption, at 36 percent of GDP, is much lower than the world average, which measures in at 60 percent of GDP. This is in part because Chinese consumers hold larger precautionary savings to guard against illness and loss of income during old age. High savings may be changeable over time; improvements in health and pension coverage are expected to continue to lower the necessary savings ratio and boost consumption. 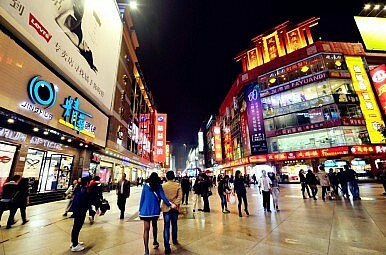 Planned expansion of urbanization should also improve consumption, and China’s cities expand and its middle class grows. Consumption, however, is dependent not only on the presence of health care and urban residence, but on jobs, and this is where the anxiety prevails. Households earning $16,000 to $24,000 accounted for only 15 percent of urban households in 2012. GDP per capita averages at only $6,807, and the population is aging. Young people are far less willing to work in labor-intensive manufacturing, and are increasingly college educated. China’s challenge now lies in creating the types of jobs that will cater to a growing mass of educated workers and provide higher incomes; as local officials have learned, simply building up urban areas does not draw in high value businesses, nor does it create middle class residents in the absence of jobs. Real changes in China’s labor force present challenges to today’s generation. An excess supply of labor (i.e., unemployment) is especially problematic among college graduates, who face an employment rate of about 70 percent just out of school. The types of jobs suitable for these individuals might normally be found in services and the higher value-added industries, which is what the economy is gearing toward but has not yet pulled off. While the reform agenda includes changes in the services sector to open it up to competition, this cannot happen too soon. When proper employment is lacking, the labor force can become less productive over time. This is something that happened in Japan during the nineties. What is more, recent policies to reduce tariffs and increase consumption of imports are positive in terms of a push to increase overall consumption, but purchases of imports actually represent a drag on GDP growth. While part of the plan is to ramp up competition in the domestic sphere by pulling in more foreign goods, the key is to widen the operating space for domestic firms in the services (including retail) industry. Already, domestic firms are facing declining profit margins in China’s cutthroat retail sector. Policies that attempt to promote entrepreneurship may help to combat this. At the time of this writing, moves were announced by the State Council to encourage the hiring of the longer-term unemployed and new graduates to stave off an unemployment crisis. Preference in bids for large-scale projects is to be given to firms that commit to hiring more people. This is on the right track, but while these policies may improve the employment outlook, they could still go further in ensuring that most firms have better access to finance, lower taxes, and strong supporting institutions. In addition, it is the restructuring toward a service-based, skills-intensive economy that is essential. In short, the restructuring of China’s economy cannot happen too soon, and job creation must lead this process. China now has a skilled labor force looking for suitable work and hoping to raise its standard of living, if only the right jobs were there.